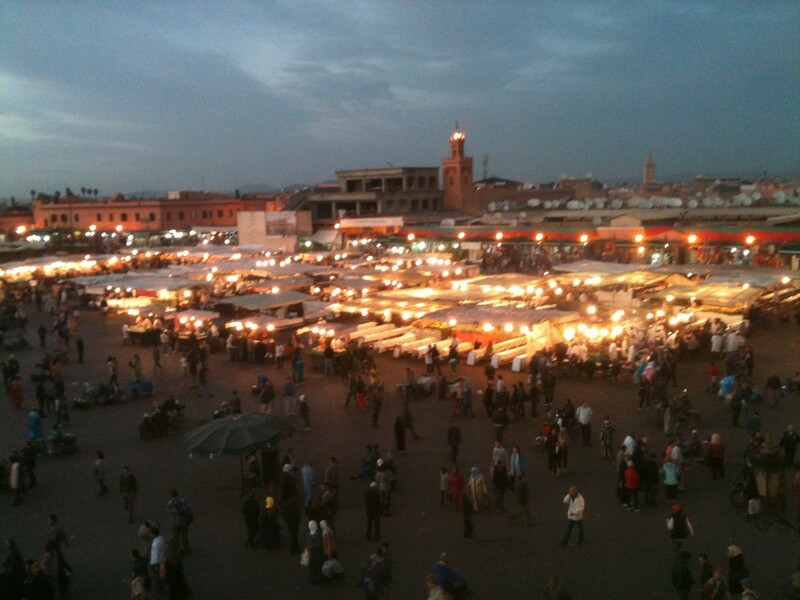 As someone that's passionate about food one of my favourite gastro-tourism trips is to Marrakesh, Morocco. The Djemaa el Fnaa is a Unesco heritage site which features everything from snake-charmers to storytellers and also has some of the most amazing food on offer so you can eat like a local. If you're looking to experience the real Marrakech and eat like the locals you need to be looking to eat out in the open air on the Place Djemaa el Fna. The Djemaa el Fna square comes alive of an evening with makeshift mobile restaurants and stalls serving local delicacies with the odd Western influences. Moroccan cuisine is hearty, tasty, and healthy and best of all well priced so many of the food stalls on the Djemaa el Fna attract many locals as well as gastro-tourists looking to savour the local culinary delights. To the west of the square closer to the towering Koutoubia Mosque minaret; Local Berbers in traditional dress, Berber dancers and storytellers delight captivated locals, while snake charmers and henna artists work their magic by their side. To the Eastern side of the square you'll find market stalls which lead you into the myriad souks of the Marrakech Medina to sharpen your bargaining skills while orange juice sellers help to quench your thirst by day and food stalls tempt you to fill your stomach by night. If you want to eat like the locals there's no denying where to eat in Marrakech. If you fancy a drink during the day you could head for one of the many terraces that surround the Place Djemaa El Fna however there's a time to do that and it's as night falls for the best views of sunset over the city. 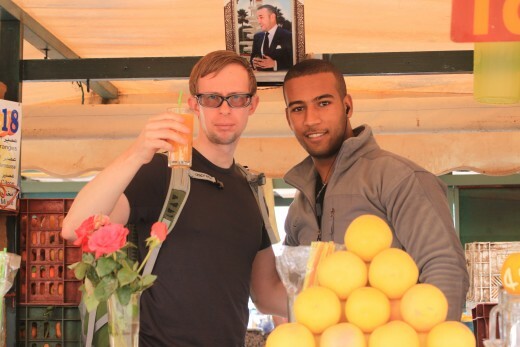 How much does orange juice cost on the Djemaa el Fna? All drinks are prepared right in front of you by friendly sellers who will provide a small amount of banter to visit their stall. If you're brave try the Lime juice which is very tart and packs amazing flavour if your palette will allow. We even saw a seller offering a shot of grappa in your juice if you wished despite consumption of alcohol being forbidden within the view of a mosque. Coincidently the stall had an excellent view of Koutoubia Mosque! If you don't want a drink just say "No Thank You" and keep walking. While it might seem like a scene from 'I'm a Celebrity- Get Me out Of Here'. Snails are a delicacy to consider sampling whilst you're in Marrakech. For around 10 Dirham’s (About $1.20 usd or £0.70gbp) you can take the plunge into trying L'escargot when eating in Marrakech- A bastion of French inspired culinary delights. A small bowl is a great early evening snack as an appetizer to your main meal and at the advertised prices you're not going to lose out if you choose they're not for you. Marakshi's are great salespeople and the food stalls and open air restaurants on the Djemaa El Fna employ a number of touts to drive tourists and locals into their respective dining rooms and earn themselves a living. These salespeople have an amazing skill for languages and developing a rapport with potential customers. Their knowledge of the English language comes from a lot of television and in particular adverts so be prepared for someone that comes across as a young Moroccan 'Derrick Trotter'. "It's Not ASDA Price. Not even Primani Price. It's Not Just Food, It’s Better Than M+S Food"
In some ways that's a part of their charm. It has a comic edge to it which really breaks the ice and gets complete strangers sat together talking. Just because you're not English doesn't mean you're safe- One Australian group of females we spoke to told us of how they'd been advised that the chef would 'Fire Up The Barbie, Sheila'. It's all in good humour. Upon sitting down you'll be issued with a menu board which will show you what your chosen food stall has available although a range of the below are likely to be available depending on the stall. All served with a piece of the local khobz (unleavened flat bread) to soak up any grease and a plate of tomato or deliciously spicy chilli based dip. Vegetable Couscous- A Berber traditional classic served with fluffy couscous that locals eat by hand. Shrimps, Octopus and the option of a Mixed Fish Plate for around 60-70 Dirham's. Moroccan Pastilla is a traditional Berber delicacy and is definitely worth tasting on any trip to Marrakech. It is effectively a sweet and savoury pie made with traditional werqa dough with a savoury spiced meat centre topped with sugar. Sometimes the meat is chicken and sometimes it is made with pigeon. For a Pastilla you'll pay around 30 Dirham on the Djemaa El Fna. The savoury and sweet elements complement each other well with a distinct taste of cinnamon spiced meat (You'll see 'Cannelle' which is its French translation on lots of menu boards). The Food Stalls on the Djemaa el Fna are exceptionally good value if you want a light dinner or a full 3 course meal. A buffet fit for a king (and queen) for less than twenty quid. Be aware that the khobz and any dips often have a small charge attached to them (generally about 5 Dirham) however everything you can wish for is exceptionally well priced by Western standards. You'll get a meal for a family on the food stalls for the cost of one person at home. This makes dining on a budget a realistic possibility during your visit to Marrakesh. It's also traditional for the stall to serve you Moroccan Mint Tea as an after dinner drink. Traditionally the Berber people of Morocco cooked over hot coals and that tradition has been maintained when you're eating out in Marrakesh on the Djemaa el Fna. Look for the small number of food stalls with smoke bellowing upwards towards the panoramic terrace of the Restaurant Glacier to the South-East of the square near the office of Maroc Poste. You can watch and smell as your meat skewers are cooked to perfection in front of you. It's cooking at its most simplistic but it makes for some of the most succulent meat you'll taste from a barbecue. Expect to pay between 30-60 dirham for brochettes depending on your choice from the menu. If you're feeling adventurous visit the stall that's serving up Sheep and Goat's Heads. Wash the spice cakes down with a cup of Ginseng and Cinnamon Tea but be prepared to be awake for the rest of the evening. A cup of tea will set you back around 5 Dirham.